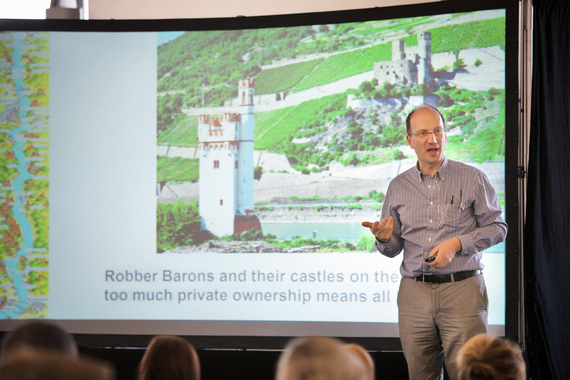 Jules Peck, convenor of the Real Economy Lab, reports on the two-day New Economy Summit that took place in early October 2015 – asking what the future could look like for money, business, ownership, cities and much more. The event drew 180 people from Bristol, the UK and places as far flung as Brazil, Spain, Greece, Chile, Thailand, Germany and S Africa. The diversity of people made the event a powerful mix of ideas and practice, with attendees from the worlds of social enterprise, business, local and regional government, academia, think tanks, social movements, faiths, finance, higher education, healthcare and philanthropy. The aim of the event was to explore and celebrate the explosion of new economy experiments that are surfacing all around the world in response to the great challenges of our times, poverty, environmental meltdown and systemic failures in everything from finance to trust. We also wanted to showcase and celebrate practical examples of the way Bristol city bioregion – home to initiatives like Happy City, Bristol Pounds, Bristol Prospects, Real Economy Cooperative, Transition Bristol, the Real Economy Lab – is responding to these challenges with new economy innovations. A stellar line-up of speakers over the two days included; Michel Bauwens of the P2P Foundation, James Berry from Bristol Credit Union, Fran Boait of Positive Money, Bristol’s Mayor George Ferguson, Tony Greenham of the RSA, Catherine Howarth from ShareAction, Diego La Moneda from Economy for the Common Good, Constance Laisné of Altgen Youth Coop, Ed Mayo from Cooperatives UK, Amanda Feldman from B Lab UK, Ciaran Mundy of The Bristol Pound, Dan O’Neill from University of Leeds, Jules Peck from the Real Economy Lab, Kate Raworth of Doughnut Eonomics, Molly Scott Cato MEP, John Thackara of Doors of Perception, Sarah Toy from Bristol city Council, and Liz Zeidler from Happy City. You can explore the event as it unfolded yourselves through photos and tweets on the event’s storify. To kick off we explored ‘doughnut economics’ – how we can find a safe space for human wellbeing on our highly threatened one planet and how the ‘eclipsing of capitalism’ which Jeremy Rifkin and Paul Mason have recently described, and growing band of next economy movements and experiments is responding to these challenges. It was clear during the two days that Bristol is very much a beating heart of UK (if not global) innovation on these issues. So it was fitting that in his slot Bristol’s Mayor George Ferguson, who has long been a strong champion for all things new economy, threw down a gauntlet and invitation to us all to use Bristol as a laboratory for experimentation and innovation on next economy thinking and practice. I expect many of us will hold him to his promise to support Bristol staying at the cutting edge of these issues. One thing that was very clear throughout is that Thatcher was wrong – there are alternatives, they are all around us if we just tune into them. We heard from leading thinkers and practitioners from across the worlds of new economy ownership, finance, enterprise models, the future of cities and their bioregions. We explored what a new p2p ‘commons’ ownership world might look like and heard about the hundreds of enterprise models around the world already working in a p2p, collaborative and commons orientated way. 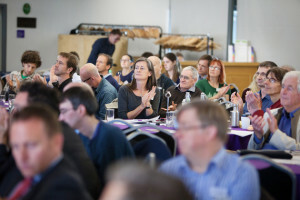 A host of other issues were surfaced and debated including things like citizens incomes, alternative currencies, interest free money, credit unions, community land trusts, open-cooperatives, the Chamber of the Commons and much much more. Diego De La Moneda described what a new Economy for the Common Good might look like for businesses and local government and how hundreds of companies and a network of Cities from Santiago in Chile to Barcelona, London (and soon hopefully Bristol) are putting the Economy for the Common Good vision into practice in a Global Hub for the Common Good. Breaking with traditional ‘listen and learn’ style conference formats, the summit used ‘open-space’ social technology and discourse sessions throughout, and was focused on everyone sharing their thoughts and plans and collaborating in break-out groups and feed-back sessions to look for ways we could all work together for the common good. And this wasn’t just about talking – by the end of the two days there were long lists of new initiatives people had hatched up over the event. One of many highlights of the event for me was hearing Sarah Toy from Bristol City Council talking about her vision for what the City can do and indeed is doing to put Bristol in the vanguard of sustainable, liveable and new economy cities. With Bristol being this year’s EU Green Capital and being one of the $100m Rockefeller Foundation’s 100 Resilient Cities initiative, I’m hoping Bristol can help show other city-bioregions leadership and inspiration in modelling what a city for the Common Good can look and feel like. Judging by the energy in the room over the two days, feedback from attendees and the amount of twitter activity, I think its fair to say the audience enjoyed the event as much as we hosts did. To be honest the only worrying thing about the event was the number of people who are now asking us to repeat the summit on a regular basis…….. This blog was re-posted with permission of the author – the original can be found on Huffington Post. Jules Peck is convenor of the Real Economy Lab, which is building an open-space, open-access platform to act as hub to support the coming together of a global movement of movements on all things ‘next economy’. His co-hosts at the summit were Angela Raffle, Simone Osborn, Peter Lipman, Dave Hunter and Ciaran Mundy. Thanks to Mark Simmons for the photography.